How big does a planet need to be to be considered a world, anyway? 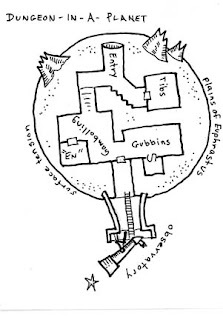 PS If there's one thing I love as much as dungeons, it's planets, and this one's both! Very nice. I'm reminded of Antoine de Saint-Exupéry's illustrations in his book Le Petit Prince. For some reason I'm reminded of Escher's Tetrahedral Planeroid here. 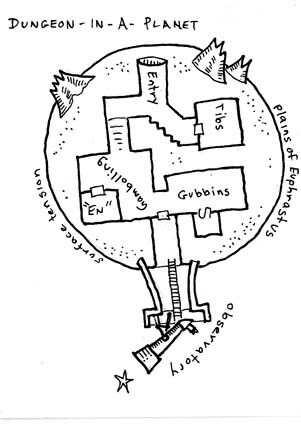 I challenge you to make a micro-dungeon for another early RPG. Top Secret? Boot Hill? Traveller? Gamma World (or its retro-clone Mutant Future)? Will you take the challenge? Dare you? Aha! I will undertake your challenge, Mr. Bennett! In fact, I will do one of each for Star Frontiers, Boot Hill, and Gamma World! Take that! @jaerdaph I loved those. I wasn't thinking of it consciously, but the boaboa planet remains buried deeply in my subconsciou. You know, I've never played or even read Spelljammer. I wasn't doing much role-playing when it came out, and it sort of passed me by. But I should check it out, because it's right up my alley. Speaking of planetary adenture, have you ever played Nine Worlds?